There are continual innovations in sports medicine. Whether it’s through biologic injections (PRP, stem cells) or advancements in rehabilitation approaches, the sports medicine community is always looking for the “next best thing” to help athletes recover and perform better. One such innovation that has gained popularity over the last few years is blood flow restriction training (BFR). ESPN did a feature on BFR in 2014 and numerous professional athletes have used this and some teams are using it regularly. Unfortunately, their are numerous interventions in our field that have little scientific evidence for their efficacy (kinesiotape and cupping for example). However, this is one innovation in the field of sports medicine that has significant scientific support for it’s use. At SSOR, we’re using it as an adjunct to rehabilitation for our patients. So what’s the deal with blood flow restriction training? Blood flow restriction training, also referred to as “occlusion training,” involves the use of a pneumatic device, similar to a blood pressure cuff (or a similar device) to restrict (NOT cut off!) arterial blood flow during exercise. It feels very similar to how you feel when you get your blood pressure taken, just not as tight. Why would I do blood flow restriction training? For some patient populations, like those with advanced knee arthritis, it causes too much pain to lift heavy weight. One of the principle objectives in rehabilitation is to build strength. Well, building strength requires higher loads/resistance. Many patients cannot tolerate higher loading – those with arthritis, the elderly, or those that have loading restrictions. Blood flow restriction training enables similar gains in strength and muscle hypertrophy (muscle size) with less loading. Several studies have shown that using BFR with exercise has improved strength and hypertrophy more than those exercises alone (Takarada et al, J Appl Physiol 2000; Takarada et al, Jap J Physiol 2004; Yasuda et al, Metabolism 2006; Abe et al, J Appl Physiol 2006; Abe et al, Med Sci Sports Exerc 2004). Furthermore, studies have shown that BFR training has improved atrophy after ACL reconstruction (Takarada et al, 2000; Ohta et al, Acta Orthopaedica 2003; Takarada et al, Med Sci Sports Exerc 2000) and even on atrophy after immobilization (Wall et al, Acta Physiol 2014; Kubota et al, Med Sci Sports Exerc 2008; Cook et al, J Appl Physiol 2010). Finally, other studies have shown that BFR training leads to less tissue damage compared to other traditional means of training (Loenneke et al, 2012). Traditional strength training may make muscles sore and usually, you need to wait 48 hours before training the same muscle groups again. With BFR training, because the loads are so low, you can train more often and the lighter loads are not likely to make you sore. Despite all the support in the literature above, studies by both Giles et al (BJSM 2017) and Bryk et al (Knee Surg Sports Traumatol Arthrosc 2016) found that while BFR did help with pain relief, outcomes like strength improvement, atrophy, and functional testing showed no difference compared to traditional strength training. Well, this is a complicated answer because it can get really boring talking about the cascade of metabolic changes that occur. In the absolute simplest terms, BFR helps increase production of muscle building hormones and substances in the blood stream (Takarada et al, J Appl Physiol 2000; Takarada et al, J Physiol 2004; Yasuda et al, Metabolism 2010; Abe et al, J Appl Physiol 2006; Abe et al, Geriatric Phys Ther 2010; Abe et al, MSSE 2004). Additionally, by limiting blood flow to muscles to muscles that need oxygen-rich blood to function (slow twitch fibers, or Type I fibers), the “fast-twitch” or Type II fibers, have to work harder (and fast twitch fibers aren’t as dependent on oxygen-rich blood like slow twitch fibers are). Fast twitch fibers are the muscles that produce the most force and are also the ones that we target when trying to get you stronger after an injury. Usually, it’s the fast twitch fibers that get the weakest and the smallest after injury or surgery. How do you do Blood Flow Restriction Training? There are many devices that can be used for BFR training (Delfi, B Strong, Occlusion Cuff are the most common in rehabilitation settings). 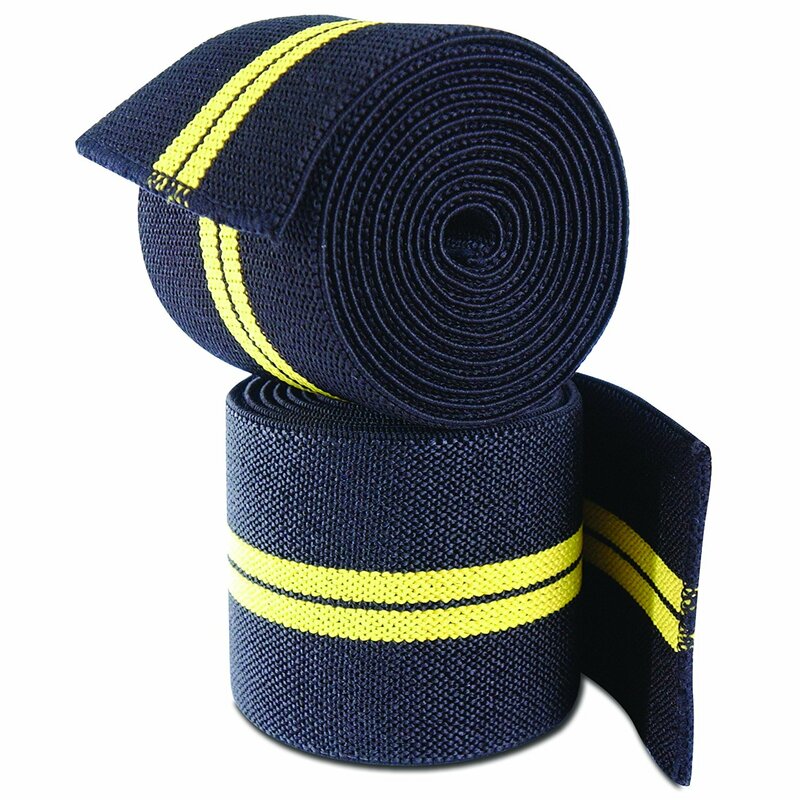 Some units cost upwards of $5000 and the most primitive types are knee wraps used in powerlifting/weightlifting. The more expensive units allow only one person at a time train with BFR, so it is not practical for teams or large groups. Plus, that can get expensive!! Fortunately, there are other options. In a study by Wilson et al in 2013, 12 trained males used knee wraps wrapped to a subjective 7/10 pain. Ultrasound imaging was used to confirm vascular occlusion, so this is an alternative method that is more budget-friendly. 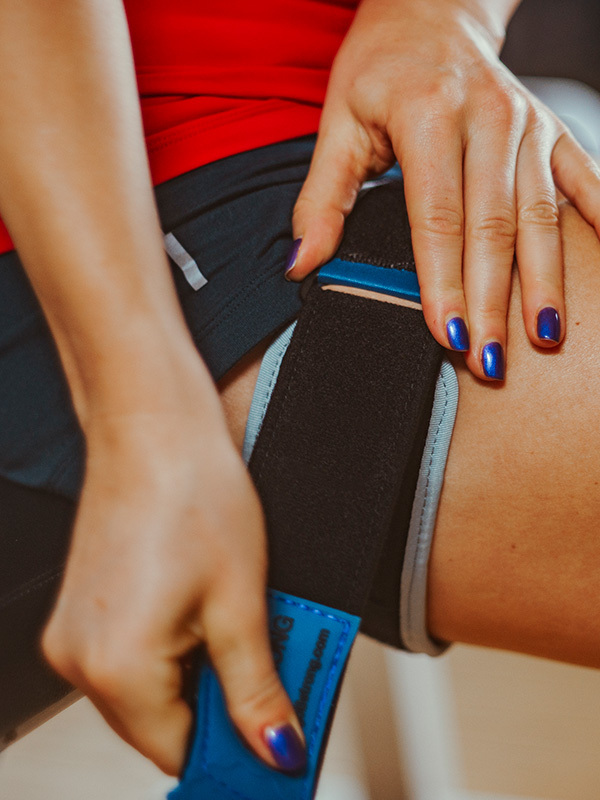 Using knee wraps, due to their cost and ability to be used with many athletes at once, is known as “practical BFR.” Another way is to use a BFR cuff around the thigh and find the pedal pulse. Pressure is increased until the pulse can no longer be palpated. Then, the clinician will take 60% of the systolic pressure and have the patient train at that intensity (Loenneke et al, J Appl Physiol 2013; Giles et al, BJSM 2017).We find that a majority of our patients fall in the 150-170 mmHg pressure. Lastly, thigh circumference can also be used as an estimate of pressure to utilize (Loenneke et al, Eur J App Physiol 2012). With a thigh circumference <45-50 cm, inflate to 120 mmHg; 51-55 cm, inflate to 150 mmHg; 56-59 cm, inflate to 180 mmHg; >60 cm, inflate to 200 mmHg. Basically, it will take more pressure to occlude a larger limb. Because of lighter loads, the athlete/patient will do more repetitions. Normally, you do 30 repetitions the first set, then follow with 3 consecutive sets of 15 repetitions. Take a minute between each set. You don’t want the cuff/wraps on for any longer than 15 minutes. This does make exercise difficult to complete and make no mistake, it’s not comfortable! However, you should complete the 75 repetitions, or be really close to it. The wrap/cuff is too tight if you have numbness in the leg or can’t complete the prescribed repetitions. This doesn’t sound safe. Is BFR safe? There’s always a few things to keep in mind. If you have varicose veins, are pregnant, have high blood pressure or cardiac disease, or have a current deep vein thrombosis (DVT) or a history of one, you should consult with your doctor. Other studies have been done on safety (Nakajima et al, Int J KAATSU Training Res 2006; Heitkamp et al, J Sports Med Phys Fitness 2015) and minimal to no negative have occurred and those effects were transient (brief numbness, petechiae on the skin). There have been reported case studies showing adverse effects (Noto et al, Internal Med 2017), but improper training methods were used, occluding for an hour every day. Surgical tourniquets are inflated for roughly two hours with a complication rate of 0.04% (Odinson & Finsen, JBJS Br 2006), so 15 minutes is far less than that. So, BFR is definitely safe if used correctly. Blood flow restriction training may help you and enhance your recovery after injury or surgery. At SSOR, we utilize BFR training on specific patient populations. Not sure if it’s for you? That’s OK, we can talk about it! Fact is, traditional methods of training work just fine – this is just another means to an end. It would be a privilege to serve you and partner with you in your care. Give us a call!